I was quite interested to see if Baptists at Our Barbecue would belittle Baptists in anyway. This LDS comedy not only belittled Baptists, but fortunately it also belittled LDS. Unfortunately though, this was another dumb LDS movie. The story follows Forest Ranger Tartan Jones (Dan Merkley) in his transfer from Provo, Utah to Longfellow. It's a little confusing where Longfellow (affectionately known as "Longwinded") is. The town is pretty evenly split between Baptists and Mormons, so one would assume it had to be somewhere outside of Utah, but the scenery looks just like Utah and Tartan does say after he arrives in Longwinded that he's never left Utah and that is why he wants to move. Tartan replaces Rich (Charles Halford) as Longwinded's ranger, and Rich is rather bitter about it. Now being bitter is simply a way of life in Longwinded. The Baptists and Mormons have a pretty good rivalry going. The local gas station has a sign out front that says, "Baptist Discount." To break the monotony up, Tartan finds love with LDS Charity (Heather Beers), who comes to Longwinded immediately after a breakup from Howard (John Foss). 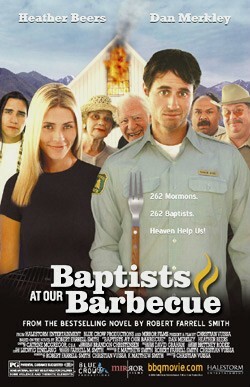 Tartan and Charity organize a town barbecue to include both Baptists and Mormons. The LDS are none too happy about the invitation being extended to the Baptists, but Tartan convinces them that they have to ask themselves what would Jesus do (WWJD) and be the bigger people. This event begins the healing process, but it takes another event to really complete it. This latter event is a certain humming that comes from the mountains. Perhaps the townsfolk think the mountains are "sing[ing] for joy together" (Psalms 98:8), but whatever it is, they take it as a sign from God to get along. Where it comes from makes no difference; what matters are the results. Nonetheless, Tartan goes out to investigate, and finds the unlikely source of blessing. I think I laughed maybe once during this movie. This was really boring. And even though Charity was pleasing to the eyes, her character or personality was less than endearing (quite unlike Beers' performance in Charly). As for spiritual application, it is a point well taken that we are to live at peace with all men (Romans 12:18). Jesus Himself took time to party with unbelievers (Mat. 11:19). Nonetheless, it must never be forgotten that our Lord did not come to bring peace, but a sword to divide even family members (Mat. 10:34-39). And this is why the believer is commanded to be separate and not fellowship with unbelievers (2 Corinthians 6:14-17). This is a separateness of participation in evil; it is not separateness from enjoying the unbeliever's company. Finally, for more reviews and information of Baptists at Our Barbecue, see here, here, and here.